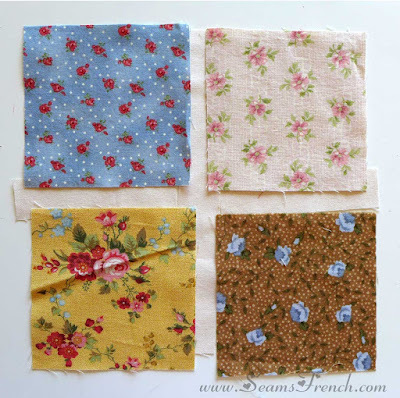 Flower Garden: A sampling of the 4 patch blocks, roughly laid out and set on point. 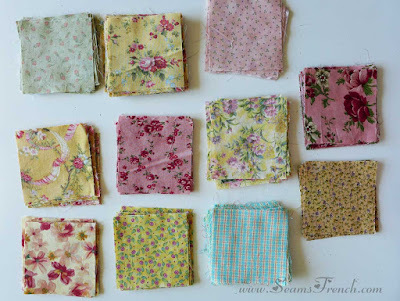 At the time, the 35 - 40 calicoes and small floral prints that I chose for this quilt were all cut into 4" squares. There were hundreds of 4" squares. The 1" beige sashing had also been cut to the different lengths required. 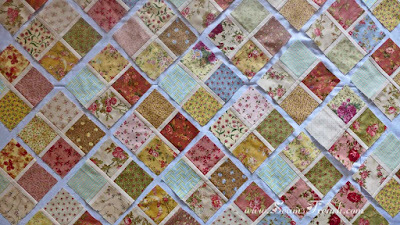 And that's as far as I got this quilt in 2005. 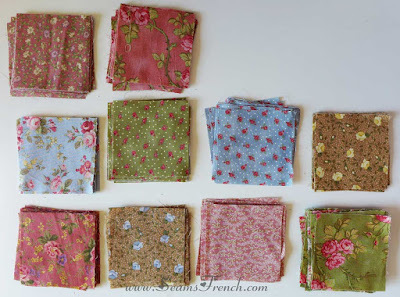 In the meantime, my daughter used some of these squares to hand piece a baby quilt when she was pregnant, adding her own creativity and more fabric into the mix. Choosing to keep to the original intent, I stayed with small florals and pastels, and divided them into darks, mediums and lights. Assembly has been very quick. (Thank goodness). Each block consists of four - 4" squares separated by the beige sashing. These blocks are then set on point and stitched to each other. It really doesn't get much easier than that. To date, I have 101 completed Flower Garden blocks, with another 24 that will be stitched by next week Monday. 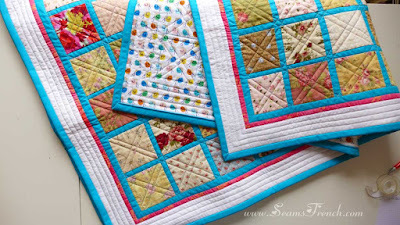 With 61 blocks from "The Scrappler" and 105 blocks from "Winging It", it takes my total stash buster blocks to 291 blocks this year. Next week Monday happens to be the 291st day of the year, (according to my count). So, much to my surprise, I'm still on track to complete 366 blocks this year. 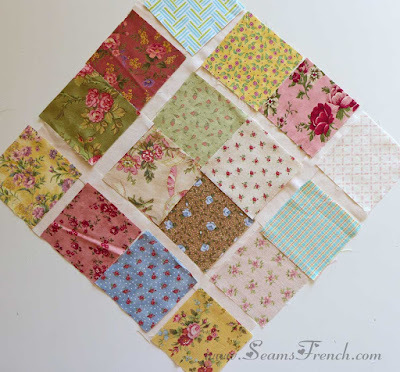 That leaves 75 more blocks to stitch for 2016. 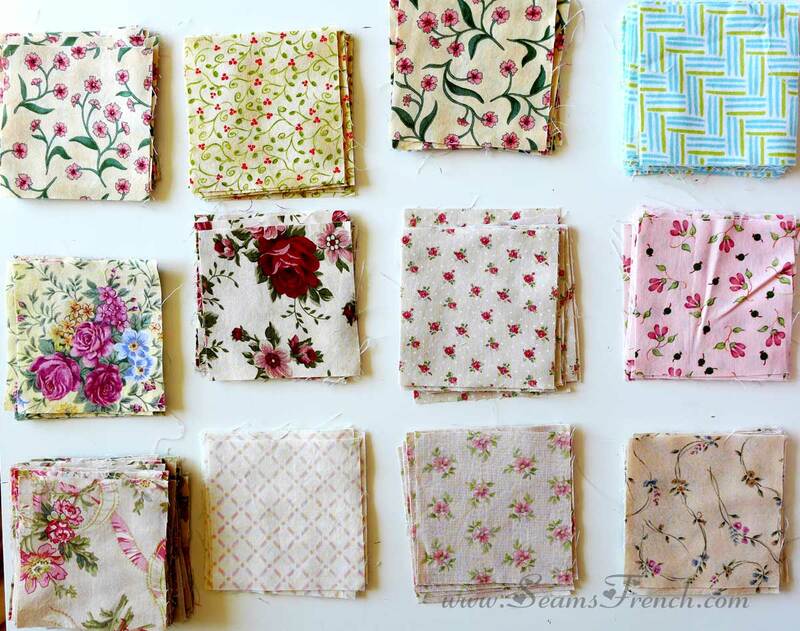 Time to choose the next stash buster project. 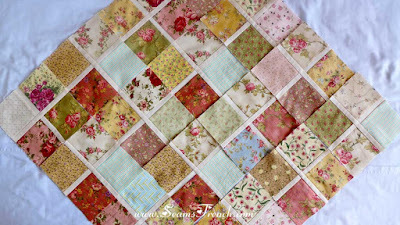 I LOVE scrap quilts...this one will be lovely! You are sure getting a lot accomplished. By the way, Happy Thanksgiving! Thanks Karen. Having been under the weather for the last two weeks, I have not done a lot more than the piecing. Hopefully whatever bug I've been fighting is gone. 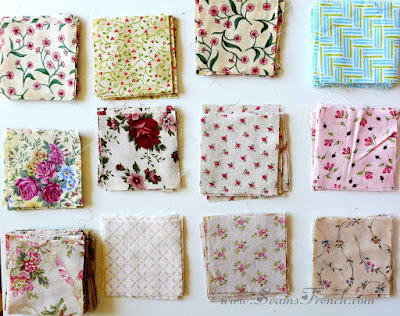 This group of fabrics is very pretty - I like the faded vintage sort of look: it manages to be calming and restful without being dull. Yeah, I think you're right about the calming effect. It kind of feels like comfort food to me; nothing extraordinary, just comfy. Guten Tag Alicja. Ich wusste es nicht das du English oder Deutsch spricht. English ist am einfachsten für mich, Deutsch nicht so gut, und leider, polnische uber haupt nicht. Ich freue mir dass wir unterhalten konnen. Danke fur den besuch auf mein blog, und schöne Grüße aus Vancouver.